Sometimes a game can go too far and with Curtis Harrington in the director’s chair this thriller goes over the edge. 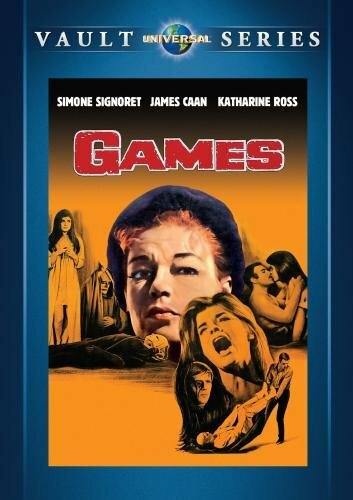 Games tells the story of a young couple played by James Caan and Katharine Ross who welcome an elderly woman played by Simone Signoret into their upscale home. One that’s complete with the all important dumbwaiter that will prove convenient in delivering some chills, thrills and even a body before the final fadeout. Caan and Ross love to play games and have a dedicated room in the home that features pinball to chess and a diverse group of partygoers to join them including Kent Smith of Cat People fame and even Ian Wolfe as the family doctor. 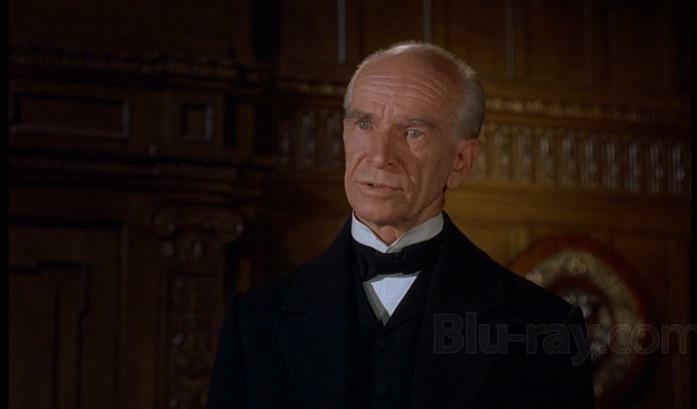 I challenge anyone not to recognize this longtime character player with over 300 acting credits to his name. The games and the costumes are rather weird at times as are the guests but when Signoret arrives at the door the following day as a cosmetic saleslady, the young couple’s lives are about to take a twist towards jokes that get out of hand. 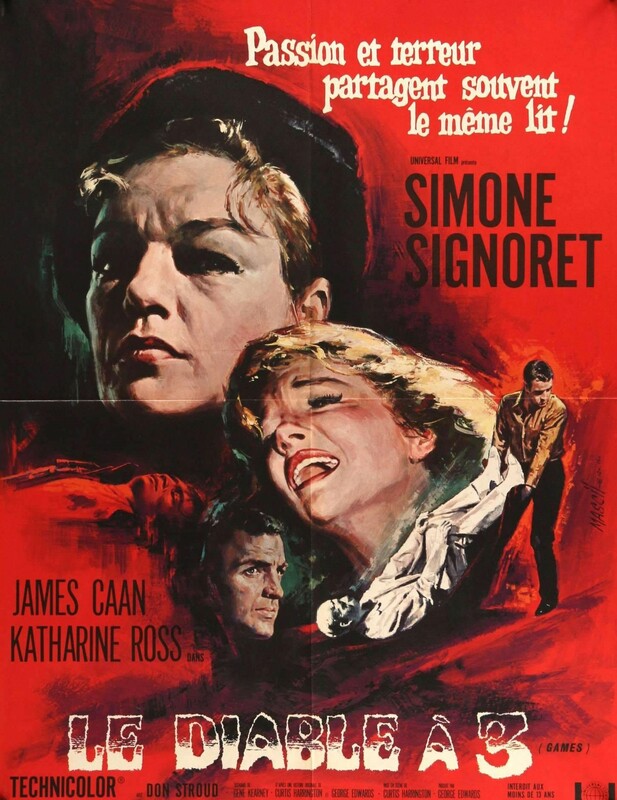 Within a few scenes Miss Signoret has all but moved in with the youngsters and proves to be up to the challenge of mind bending games involving past lovers and dueling pistols. Then there’s the crystal ball, the taro cards she loves to read and that damned “death” card we all expect turns up. The trio begin to take sides with the gags like the one where Caan comes home to find a naked Don Stroud in Ross’ closet. It’s all a gag on poor Jimmy and he proves to be a good sport about it. Stroud for the record is the delivery boy for the local grocer. Did I mention he’s the biggest grocery boy I think I’ve ever seen. He’s also clearly got an eye on Katey. Out come some bizarre party masks and organ music that is instantly identifiable for those of us who were raised on Don Knotts and The Ghost and Mr. Chicken. Yes it’s the same tune employed here that scared poor Don half way to death’s door in the comedy classic when he climbed the stairs to the loft in the old Simmons place to witness the blood stained organ keys playing the haunting tune with no one pressing down upon them. The plot is to take a bloody turn when Caan decides to get back at Stroud by having Ross playing seductress to the unsuspecting delivery boy. 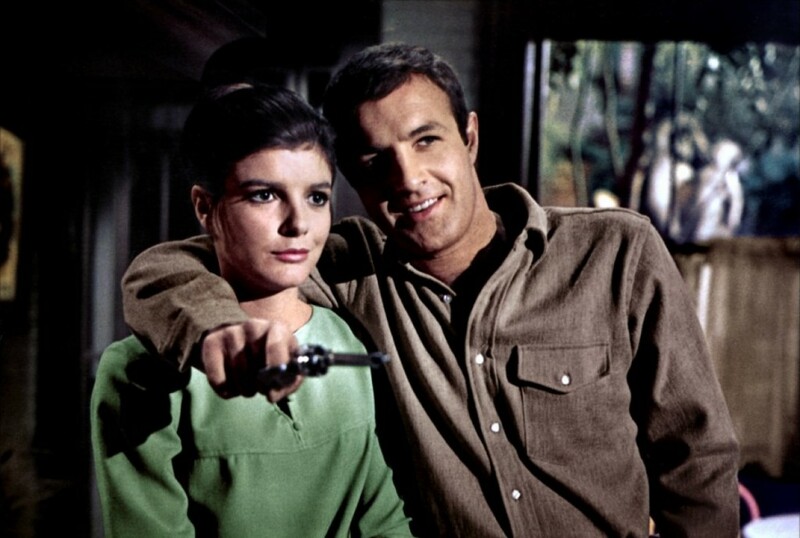 He catches him in the act of ogling his wife and pulls one of the dueling pistols on Stroud. Fires a couple blanks and then on the third shot strikes Stroud in the face killing him stone dead. The pair are in shock. If they call the police they’re positive no one will believe them. They opt for damage control and begin the cover up. The one thing they do agree on is not telling Signoret for fear the old gal will bleed them dry with a blackmailing scheme. Time to wrap that bloody body up in a white bedsheet and send him from the basement to the top floor in the handy dandy dumbwaiter. Well I’ve set it up to hopefully peak your interest because the film’s only about half way over by this time and there are plenty of twists and turns to come at you head on before the final credits roll. This was a first time viewing for me of a film I picked up on a whim. I came across a DVD from the Universal Vault Series and I like the trio of actors involved. It’s since come out on blu ray via the Scream Factory folks. It’s a warped tale with more than just a couple of nasty turns and I loved every one of them. If anything the movie reminded me of 1972’s Sleuth from writer Anthony Shaffer that starred Michael Caine and Laurence Olivier. A movie where the plot twists keep coming as the game continues. For those unfamiliar with the director Harrington, he excelled at tales of the macabre and outright chillers. Among his efforts you’ll find Night Tide, Queen of Blood, What’s the Matter With Helen? and Devil Dog : The Hound of Hell. According to the trivia section over at the IMDB Marlene Dietrich was the intended actress to play the elderly woman who has come to nest with the young couple and while I can see Marlene easily fitting in, Miss Signoret suits the film much better. 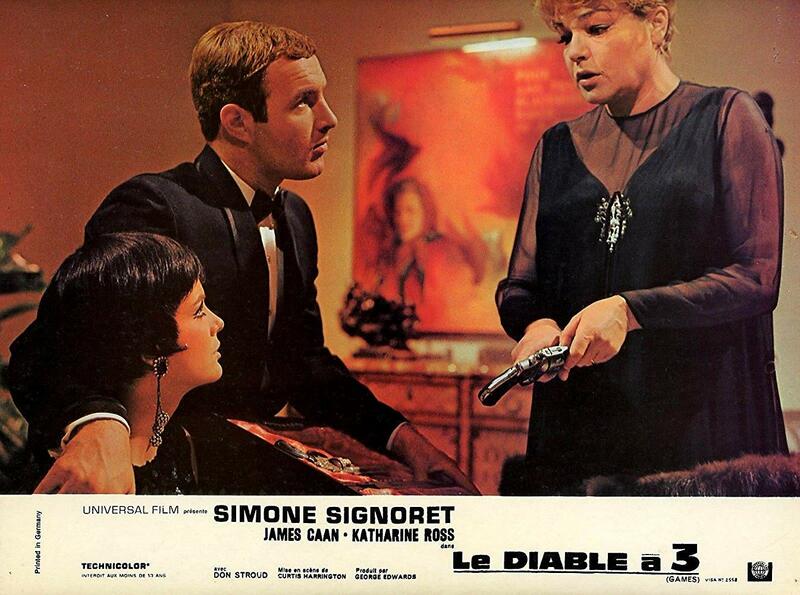 Especially for those of us familiar with her famous film Diabolique from 1955. Ross was already well schooled in television roles and was beginning to land more theatrical films culminating in what is likely her most famous role opposite Newman and Redford in Butch Cassidy and the Sundance Kid. Unless you prefer The Stepford Wives I suppose. Like Ross, Caan too had graduated from TV and by this point had worked with Howard Hawks on a pair of films and a young Robert Altman as well. Games is a nice fit for the rising star who would hit his stride in the decade ahead. Thanks, Mike; I’ve never heard of this one! And, yes, well… I do prefer The Stepford Wives. Thought you might….. Anyway Games has a delicious flavor to it so I’ll; look forward to seeing what you have to say if you cover it.